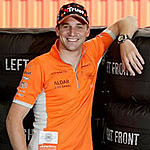 No matter how hard decision it was, the Spyker F1 team management has confirmed that Christijan Albers will no longer race for them in this season. According to the Spyker F1 team boss, Colin Kolles the decision has nothing to do with Albers' performance. Banal it may sound, but the main reason of such a tough decision was a problem with the driver's personal sponsors. It is still unknown who will replace Albers. Possible alternatives are Honda's third driver Christian Klien, Ferrari tester Marc Gene and Williams tester Narain Karhtikeyan.